METdance’s upcoming production Better Together features a selection of six works that demonstrate the power and strength in unity and how connection is sparked through community and collaboration. The theme of this show is as to the point as the title suggests. “The way the that the world is right now – we are better as a unit, and we’re better as a whole,” explains METdance Artistic Director Marlana Doyle. With that theme in mind, the evening includes thoughtfully selected works by Robbie Moore, Kyle Abraham, an excerpt from METdance’s most recent production of DUO, and a world premiere by Katarzyna Skarpetowska. Also joining them on this bill is their youth company MET too and touring company iMEE (Infinitive Movement Ever Evolving). Robbie Moore’s piece “Murmur” speaks to the anatomical structure of the heart, and the inconsistencies and effects created by heart murmurs. This piece was originally created on METdance in 2018 with an original score by Nicholas Robert Thayer. It features nine dancers across four distinct sections, with the four sections representing the four chambers of the human heart. The piece evolves with a palatable intensity from quick gestures and corporal vibrations to intricate partnering sequences and ultimately ending in an exhaustive state. “When We Take Flight” is also an ensemble piece that was created by award-winning choreographer Kyle Abraham. The work was originally conceived in benefit to Dancers Responding to AIDS for their 2013 Fire Island Dance Festival. Abraham took inspiration from Ryan Lott’s musical score, the ocean, and communities that come together in support of causes. “‘When We Take Flight’ is about the unity in flying,” says Doyle. “It’s so broken up, and then they come together in the end. It’s so satisfying.” METdance recently performed this work in their November production of the same name. 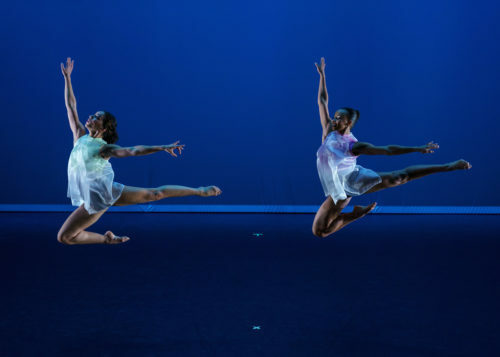 METdance is also the first company outside of Abraham’s own company to perform this work, and the only company in Texas to have his work in their repertory. Katarzyna Skarpetowska is a frequent-flyer at METdance. She sets a new work on the company every three years. Again this year, she is creating a world premiere. Doyle explains, “Kate is doing something kind of electronic and industrial. She’s going to pull the legs out and have a bare stage.” Skarpetowska has received several recognitions for her choreographic efforts. Most significantly, she was named in Dance Magazine’s 2016 “25 to Watch” list and was nominated for a The Bessie award in 2017 as an emerging choreographer. The fourth work performed by METdance on this bill is an excerpt from their most recent production of DUO. METdance has presented DUO in February for the past five years. Each year, the program consists of a series of duets created by acclaimed choreographers from across the country. In relation to the Better Together theme, these duets explore the idea of two heads being better than one. Part of METdance’s operations include a youth company called MET too. Due to the strength of these youth dancers, Doyle has invited them to perform on the same bill as the professional company. “They are performing a piece by Madi Hicks,” says Doyle. “It’s about loving each other and being kind.” Hicks is an up and coming choreographer who is a graduate of both Booker T. Washington School for the Performing and Visual Arts and Juilliard. Also guesting on this program is iMEE. iMEE is a touring project company that is dedicated to presenting innovative, original contemporary dance works, featuring acclaimed guest artists from around the world. For this program, they will present a piece titled SHOTGUN choreographed by Maurice Causey and includes two dancers courtesy of Houston Ballet, Jessica Collado and Oliver Halkowich, as well as Melanie Martel and Randolph Wald. A narrative piece, SHOTGUN adds some humor to the program as the work reflects on life’s quirks, delusions, and relational friction. There are two opportunities to see METdance’s show Better Together. Performances will take place on April 12 and 13 at 8:00 PM at the Hobby Center for Performing Arts. Tickets are available here. « NobleMotion Dance Announces 2019 Summer Intensive Instructor Lineup!